All by my freaking chance on an absolute off-chance. But the dream did come true. Muse had put their summer stadium tour on a DVD and announced exclusive screenings across the world on 5th November, including Leicester Square. Of course I bought a ticket for that, with hopes that they would maybe attend that screening, what with it being Leicester Square – Mekkah of all premieres. But they had moved the location of the screening away from Leicester Square and my hopes died when I saw the picture on their Twitter, that Muse had gone to Paris by Eurostar. After the premiere, I thought they might be on the last train back, but every single one of my friends in the Museland and myself were convinced they would stay in Paris – it’s freaking Paris after all. But what did I have to lose other than less than an hour waiting for the last Eurostar to pull into St Pancras International. 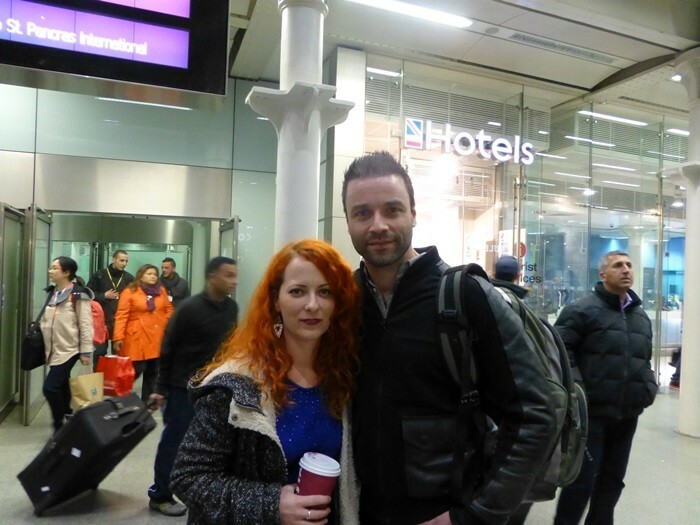 Went straight up to him and asked shyly hesitantly if he may have some time for a picture (OMG I was so nervous, I was about to pee my freaking pants lol) I somewhat felt bad and intrusive for bothering him, thinking he probably didn’t expect anyone to be waiting for him at St Pancras. So we both posed for the picture and then I’m like “do you reckon you have time for an autograph please?” and he nods and is still quiet and just observant with his biiiig beautiful eyes and so I get the ticket from the premiere out and he signs it. He smiles his big grin and stops and I quickly shuffle over to him and Matt has stopped too and I ask again shyly if they have time for a picture and apologising for shaking like a crazy person. 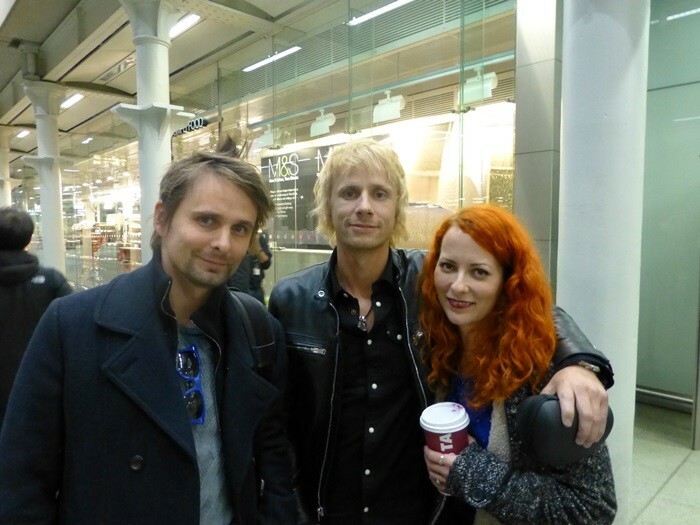 Then Dom is like “of course” and throws his arm over my shoulder. Like seriously, I was shaking already like a mad person, but my god, my brain just went blank…. So we’re posing for the picture, Dom, Matt and myself, and I’m dying a happy death with the weight of Dom’s arm on my shoulder and it hits me that I’m actually meeting all 3 guys in one go without any other fans around, which makes me shake even more, but I need to drag out this moment somehow. So I ask if they possibly have time to sign something, and they say yes!! phew. moment of pure bliss prolonged. I get the premiere ticket out with shaky hands as quickly as possible, because I don’t wanna keep them too long and become a burden, and Matt’s like “what the hell did you whack out so quickly? ?” so I explain that it’s the ticket from the premiere which gets him all giddy and excited and I can just stare into his beautiful eyes when he asks me how I found it! Forever from now, I will remember, remember the 5th of November. Hahaha I like the ending! Well, I’m glad for you, you already met a lot of stars but your fav band is something! Chris is hot! I remember being starstruck at a dinner my offic ethrew out with David Suchet haha. I always liked Hercule Poirot! 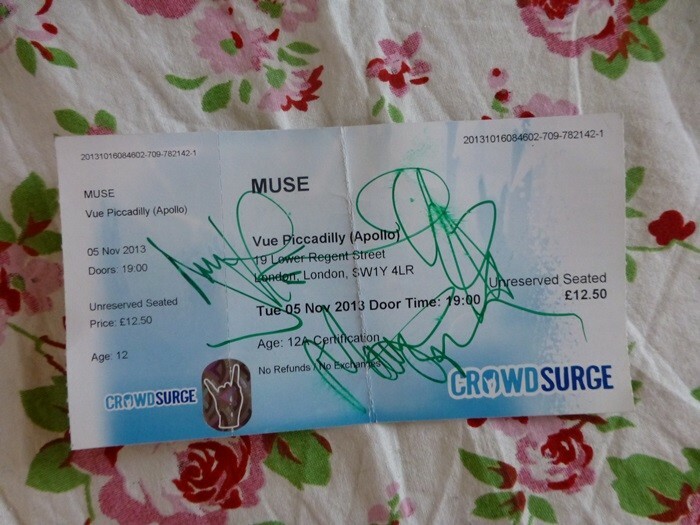 So freakin jealous, absoutely love Muse. Endlessly was my first dance song at my wedding and the tables were named after Muse songs.